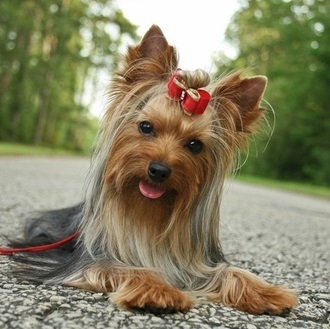 Yorkshire Terriers, also known as Yorkies, are small lively dogs with a long silky coat. The square-shaped body is very compact and well-proportioned. The topline is level. The head is small and flat at the top. The muzzle is medium length, with a black nose. The bright eyes are dark. The small ears are set relatively high; they are erect and have a triangular shape. The teeth should meet in a level or scissor bite. The feet are round with black toenails. The tail is usually docked to half is natural length. The Yorkie's weight averages 7 pounds. The height is about 8 inches. Even though they are almost tiny, Yorkies have a very vigorous spirit. They are amazingly self-confident and stubborn, but loving and affectionate at the same time. While you wonder where this little dog takes its energy, Yorkies will keep on their bustling activity full of curiosity and enthusiasm. They are extremely smart but can be slightly difficult to train due to the wilful streak. Usually, Yorkies do not get along well with other animals. They tend to pick fights with other dogs even if those are larger, as if a Yorkie is not aware of its own size. They can be snappish if scared, surprised or teased too much. Proper socialization is necessary to avoid behaviour problems. Can be hard to housebreak. These adorable cuties need a lot of companionship and attention as they are very dependant on people. Let's face the truth: Yorkies are really hard to resist but they have a character of their own to be reckoned with, so may not be the best choice for every family. Be sure to remain a good pack leader at all times lest the dog develops the "small dog syndrome". Yorkshire Terriers have a long glossy coat that comes in steel blue colour combined with tan. Puppies are born black and tan. The coat should be groomed regularly even in non-show dogs, otherwise the Yorkie may look miserable. Shedding is very light in this breed. Yorkies are sensitive to cold and prone to slipped stifle and eye infections. The teeth tend to be weak and decay, so you should clean them regularly. Also, make sure to give your York dry food to help the teeth be strong. The lifespan is 12 to 15 years.